The bones of the foot provide mechanical support for the soft tissues; helping the foot withstand the weight of the body whilst standing and in motion. Tarsals – a set of seven irregularly shaped bones. They are situated proximally in the foot in the ankle area. Metatarsals – connect the phalanges to the tarsals. There are five in number – one for each digit. Phalanges – the bones of the toes. Each toe has three phalanges – proximal, intermediate and distal (except the big toe, which only has two phalanges). 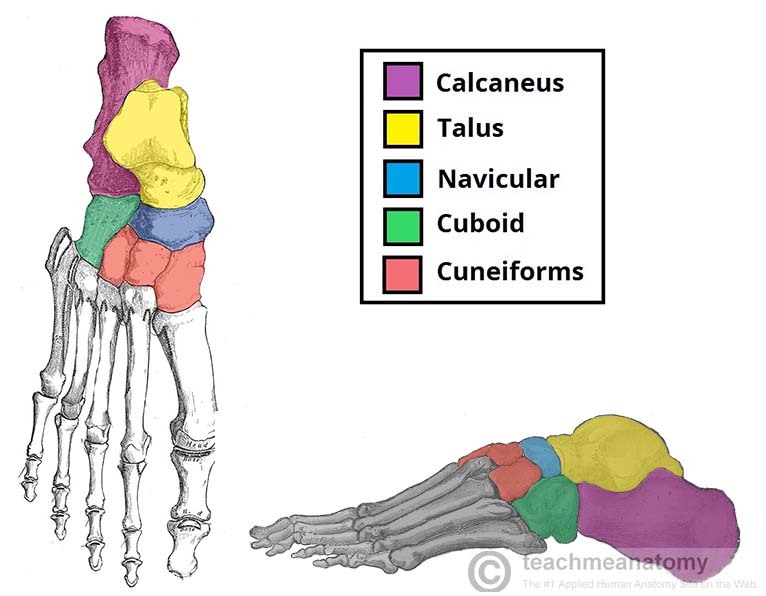 The foot can also be divided up into three regions: (i) Hindfoot – talus and calcaneus; (ii) Midfoot – navicular, cuboid and cuneiforms; and (iii) Forefoot – metatarsals and phalanges. In this article, we shall look at the anatomy of the bones of the foot – their bony landmarks, articulations and clinical correlations. Fig 1.0 – Overview of the bones of the human foot. The tarsal bones of the foot are organised into three rows; proximal, intermediate and distal. The proximal tarsal bones are the talus and the calcaneus. These comprise the hindfoot, forming the bony framework around the proximal ankle and heel. Superiorly – ankle joint – between the talus and the bones of the leg (the tibia and fibula). Inferiorly – subtalar joint – between the talus and calcaneus. Anteriorly – talonavicular joint – between the talus and the navicular. The main function of the talus is to transmit forces from the tibia to the heel bone (known as the calcaneus). It is wider anteriorly compared to posteriorly which provides additional stability to the ankle. Whilst numerous ligaments attach to the talus, no muscles originate from or insert onto it. This means there is a high risk of avascular necrosis as the vascular supply is dependent on fascial structures. Superiorly – subtalar (talocalcaneal) joint – between the calcaneus and the talus. Anteriorly – calcaneocuboid joint – between the calcaneus and the cuboid. It protrudes posteriorly and takes the weight of the body as the heel hits the ground when walking. The posterior aspect of the calcaneus is marked by calcaneal tuberosity, to which the Achilles tendon attaches. Fig 2 – The tarsal bones of the foot. The intermediate row of tarsal bones contains one bone, the navicular (given its name because it is shaped like a boat). Positioned medially, it articulates with the talus posteriorly, all three cuneiform bones anteriorly, and the cuboid bone laterally. On the plantar surface of the navicular, there is a tuberosity for the attachment of part of the tibialis posterior tendon. The cuboid is furthest lateral, lying anterior to the calcaneus and behind the fourth and fifth metatarsals. As its name suggests, it is cuboidal in shape. The inferior (plantar) surface of the cuboid is marked by a groove for the tendon of fibularis longus. The talus and the calcaneus sit in the proximal part of the foot and ankle, and are involved in transmitting forces from the body to the ground. They are the most frequently fractured of all the tarsal bones. Talar fractures most commonly occur in the neck of the talus (50%) but can occur in the talar body or lateral process, with those in the talar head being the least common. Neck fractures – typically high energy injuries, caused by excessive dorsiflexion of the foot. The neck of the talus is pushed against the tibia. In this type of fracture, the blood supply to the talus may be disturbed, leading to avascular necrosis of the bone. Body fractures – usually occur from jumping from a height. In any fracture of the talus, the malleoli of the leg bones act to hold the fragments together, so there is little displacement of the fracture pieces. The calcaneus is often fractured as a result of axial loading, typically from a fall from a height. These patients should be assessed for associated injuries such as fractures of the lumbar spine or lower limb. The bone can break into several pieces – known as a comminuted fracture. Upon x-ray, the calcaneus will appear shorter and wider. Even after treatment, a calcaneal fracture can cause further problems. The sub-talar joint is usually disrupted, causing the joint to become arthritic. The patient will experience pain upon inversion and eversion – which can make walking on uneven ground particularly painful. The calcaeno-cuboid joint can also be affected. 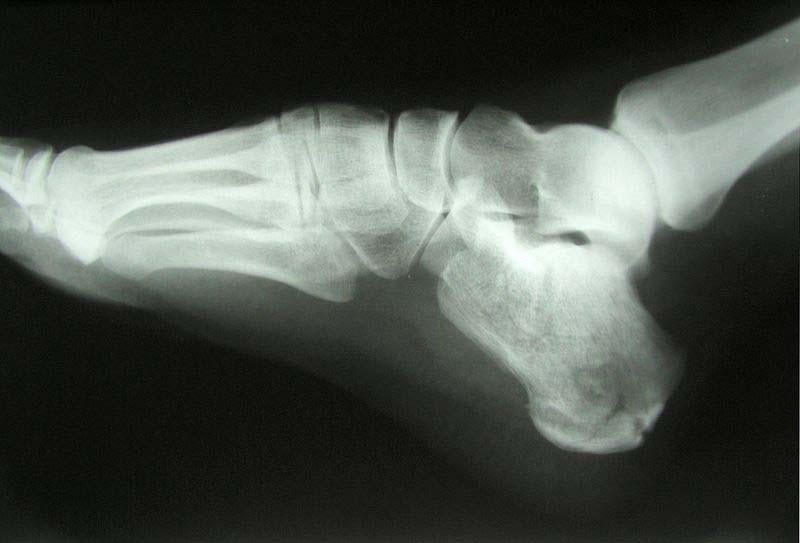 Fig 3 – X-ray of a calcaneal fracture. The metatarsals are located in the forefoot, between the tarsals and phalanges. They are numbered I-V (medial to lateral). Each metatarsal has a similar structure. They are convex dorsally and consist of a head, neck, shaft and base (distal to proximal). Proximally – tarsometatarsal joints – between the metatarsal bases and the tarsal bones. Laterally – intermetatarsal joint(s) – between the metatarsal and the adjacent metatarsals. Distally – metatarsophalangeal joint – between the metatarsal head and the proximal phalanx. Metatarsal fractures can occur by three main mechanisms. The most common method of fracture is a direct blow to the foot – usually from a heavy object dropping onto the foot. Another type of metatarsal injury is a stress fracture, an incomplete fracture caused by repeated stress to the bone. It is common in athletes and occurs most frequently at the necks of the second and third metatarsals and the proximal fifth metatarsal. The metatarsals can also be fractured by excessive inversion of the foot. If the foot is violently inverted, the fibularis brevis muscle can avulse (‘tear off’) the base of the fifth metatarsal. The phalanges are the bones of the toes. The second to fifth toes all have proximal, middle and distal phalanges. The great toe has only 2; proximal and distal phalanges. They are similar in structure to the metatarsals, each phalanx consists of a base, shaft and head. How many tarsal bones are present in the foot? 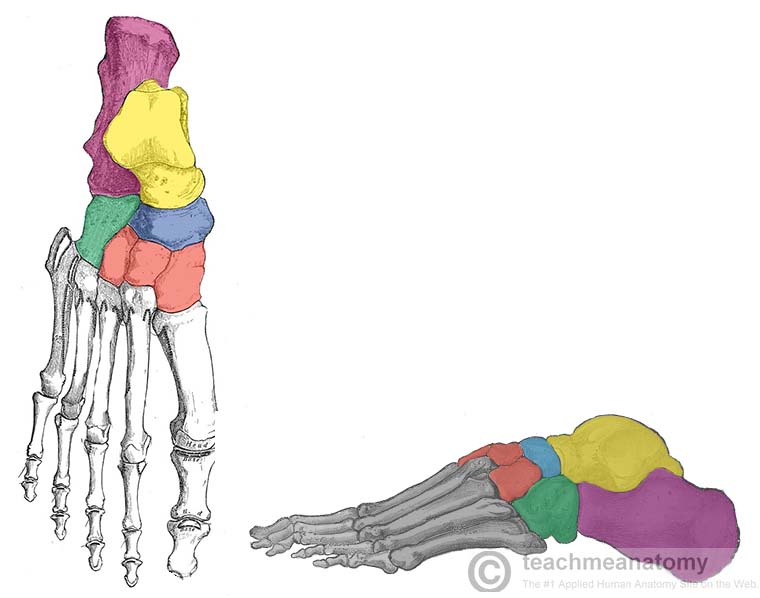 Below is an illustration of the bones of the foot. Which bone has been highlighted in blue? Regarding the talus, which of the following statements is TRUE?